Independence Day weekend in America calls for celebration, reflection and three days of fun. We used one of those days to throw a little purple mountain’s majesty and amber waves of grain in to the mix too, with a quick road trip to Greeley, Colorado. The craft beer scene along the Front Range of the Rockies really is the best in the world, both in the sheer number of breweries and in the consistent quality of beverages that are being produced. Fort Collins gets all the love in the northern part, but as we learned on Friday, Greeley is holding its own in the scene. The original plan was to head down and take in some rodeo action on July 3rd and then hang out for the Western Underground concert which was slated to being at 11:30 pm that night. Lo and behold, the Stampede doesn’t have rodeo on the last Friday of its event so we were left with plan B. We had met the guys from Wiley Roots Brewing at the Wyoming Brewers Festival, so we determined that we’d hit the Greeley Brewery scene. 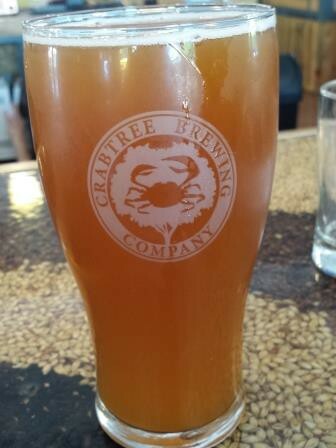 We left Cheyenne around 11:30 and the only brewery that was open when we arrived was Crabtree Brewing. We had never been there before, and I hadn’t even heard of it, so it made for a good jumping off point. It was at Crabtree that we learned that three of the breweries in Greeley were hosting a collaboration day to celebrate the Stampede. The three breweries started with the same base and each one put their own twist on the beer. 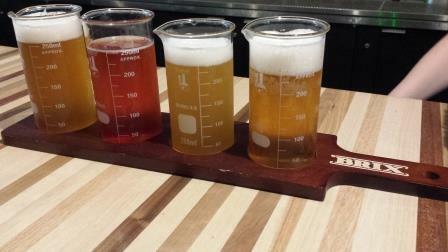 Each brewer chose a yeast strain to ferment it with and added other special touches. Enjoying a pint at each brewery got you a commemorative pint glass to take home at the end of the day. Being in tourism, I’m always a fan when local businesses get together and encourage stopping at multiple locations. It worked perfectly for us, as we probably would not have made an effort to get to all three breweries over the course of the day. You offer us a free pint glass though and we will stop at nothing to achieve it, type A drive personalities we are. After we were done with Crab Tree we headed over to Brix in downtown Greeley. This place has a cool vibe and will shortly become the 4th brewery in Greeley once all of the paperwork is completed. They have nearly 60 beers on tap and offer great taster trays so you can sample a number of beers. We ordered a panini for lunch which was very good and enjoyed our flight of beers. They offer indoor and outdoor seating and the butcher block bar top is very cool. This place, by far had the best vibe and I hope it does well in downtown. After a quick and refreshing nap at the hotel, we headed out to try the other two collaboration beers. First we stopped into Wiley Roots and checked out their tap room. 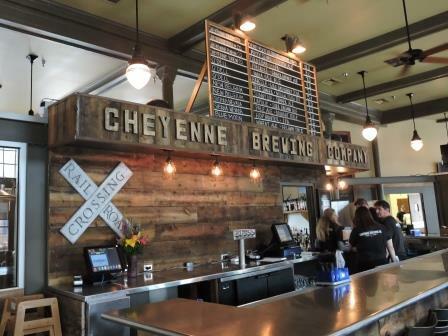 As I mentioned before our first exposure to them came a couple of weeks ago in Cheyenne so we were excited to visit them and try their beer.Their tasting room has a more industrial feel, with a big garage door and a wide open space. After we were done with the beer we headed on over to Broken Plow. Located in a strip mall, they feature inside and outside seating. There was a food truck and live music was getting ready to play. We had the final collaboration brew and got our pint glasses. Looking over their beer menu, I was intrigued with several of their offerings so we grabbed a small taster tray. At the end of the day, I was blown away at how strong the brewery scene is in Greeley right now. There is a variety of beers, vibes and locations that will make just about anyone happy, and there is enough variety that stopping at three or four of them gives you a real ability to spend a day or two just exploring that scene. When we finished up at Broken Plow it was time to head over to the Stampede and enjoy some great rodeo music. Western Underground was playing the free stage at 11:30 that night, once the Joe Nichols concert let out. My wife is a huge fan of theirs and it is so cool to watch them keep the memory of Chris LeDoux alive and well throughout the west. We had lots of time to kill before the show started, so we wandered the food midway taking in the smells and sights of the carnival. We decided to grab and Indian taco for dinner. 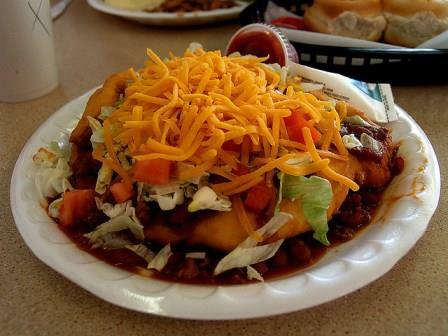 Indian Tacos are new to me, yet one of the can’t miss foods to enjoy on the rodeo grounds .They are tasty treat to enjoy once or twice a year. Western Underground took the stage as the crowd was filing out of the first concert and did they ever put on a show. I’ve been to several of their concerts now, and each one has been a unique experience. We’ve seen them in a 200 person mountain roadhouse and in a 5,000 person event center. This was cool though. There were six or seven thousand people singing along to great country music, having a blast and the fun lasted for better than 90 minutes. They played a lot of favorites, and a few songs we hadn’t seen them do the last two or three times. The guys were having a blast, and when Ned LeDoux sang “This Cowboy’s Hat” it just brought the house down with the memory of Chris. In the two years we’ve been out here, Greeley wasn’t at the top of our list of places to visit. That’s a mistake on our part. Our 18 hours in Greeley were not nearly enough, and with a rebounding downtown, great brewery scene and the Stampede, we will be making an effort to actually get down there on a rodeo day next year and experience it all. For those who are regular followers of this blog you know my affinity for the exploding craft beer scene in Central New York State. Having promoted tourism and culinary experiences there for 12 years, its easy to root for the hard working people that are putting forth an awesome product. I was part of the team that green lighted the Brew Central project, and I’ve watched it catch fire from afar. This week they rolled out the next generation of Brew Central. The Central New York Travel Region received a half a million dollars for this year’s campaign from the state of NY which allowed for the overhaul. The website looks sharp, is much more responsively designed and brings photos and videos to the forefront. The coolest thing about the new updates is the new and improved Brewfinder mapping feature. As a craft beer traveler I’m always looking to see which breweries are near where I’m at, or are clustered together. This should be much more effective for the traveling public and a boon for the breweries, distilleries, cideries and wineries. The website still features news and events from the region and new stories from 12 more producers this summer. Great job ABC Idea Based Marketing and Central New York Tourism. Rodeo is still a big part of the Western American experience and two years ago when I moved to Cheyenne, I had little to no knowledge about rodeo and how big it was. In fact we met Miss Rodeo NY at that first Cheyenne Frontier Days, and I would not have been able to tell you that there was such a thing. Don’t get me wrong, I’m not “city folk” It’s just in dairy country where I grew up, it was a better skill to know who to back a manure spreader into the barn than it was to rope and brand a calf. July is full blown rodeo season along the Front Range. Greeley, Estes Park, Pine Bluffs and Cheyenne all have rodeos during July along with countless other Wyoming and Colorado towns. 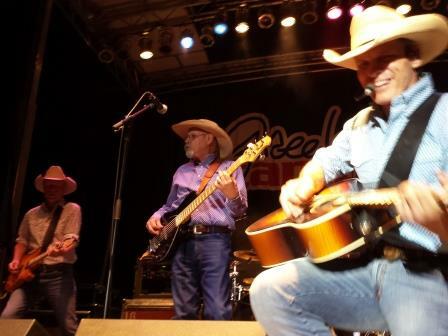 In Cheyenne, Frontier Days turns the town upside down with nearly 250,000 visitors, the best country music lineup around and 10 days of total fun. We kick it off this weekend by heading to the Greeley Stampede. We will catch rodeo action and then hang out into the early morning hours to catch Western Underground’s performance. 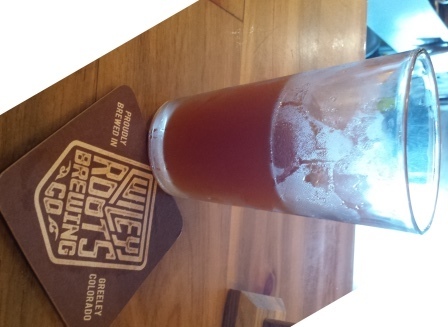 While there we plan to visit Wiley Roots Brewing as they were fun to talk with at the Wyoming Brewers Festival. 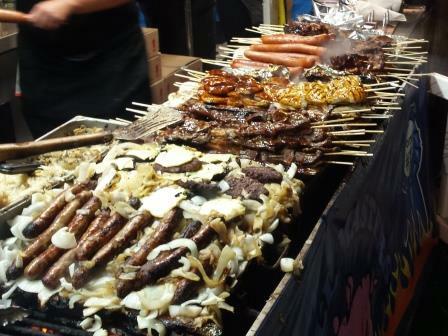 We will also partake in a variety of rodeo foods and can’t wait to post what we find. 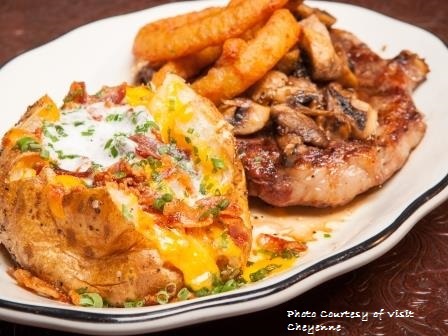 The cool thing about traveling to visit rodeos, is that all of these towns have great steak houses, and a lot of food options brought in just for the rodeo action. The downside of rodeo season is that there will be a lot of Coors and Coors Light consumed over the next month, but fear not, this guy knows where to find a fat tire or two on the rodeo grounds! So say a blessing for my digestive system, its rodeo season! A few weeks back I told you about my first Rocky Mountain Beer Run with Big Choice Brewing in Broomfield, CO. After the run was complete, we struck out in search of craft beverages and lunch. I knew that in nearby Erie there was a cidery, and a little research told us that they also served food. Two problems solved, so we struck out in search of the Old Mine Cidery. Ever since Matt and Juanita Critz opened Harvest Moon Cidery in Cazenoiva, NY, Lorrell and I have been huge cider fans. I may try my hand at making my own hard cider later this summer or early fall. 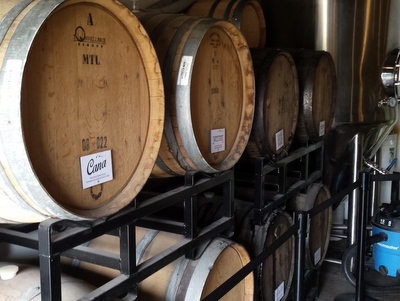 So when we can find a cidery it is a great opportunity for us to expand our craft beverage enjoyment together. 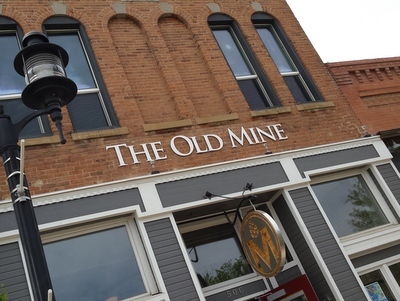 The Old Mine opened a little over a year ago and offers a bright and airy tasting room on the main drag in Erie. It is in a historic building that has been nicely renovated and is by some great coincidence or stroke of luck, connected to an ice cream parlor. If you walk past the bar and into the back, you will find a fabulous patio. The patio is adorned with picnic tables and umbrellas, along with Adirondack chairs. There are typical brewery games to be found and it is just a great summer space. As for the ciders, wow. They seem to be treating their cider program much like a beer program. They had several barrels of their cider aging and the selections went beyond the typical fruit forward ciders. There is one that is hopped with Citra hops, another that was aged in tequila barrels and a third that has black currants as part of the mix. I ordered an Imperial Tart which clocks in at 9% ABV and provided an interesting balance between to the sweetness often found in ciders. I enjoyed it, and rated it 3.5 stars on UnTappd. They also have an impressive selection of rotating taps to choose from if you want to keep with beers. The food menu was a great surprise with a lot of locally sourced ingredients and a nice selection of pizzas, sandwiches and apps. They also sell handle bar mustache pretzels which are soft, warm and salty. We ordered up a selection of cheesy bread and a pizza with artichoke hearts, mushrooms, spinach and basil. 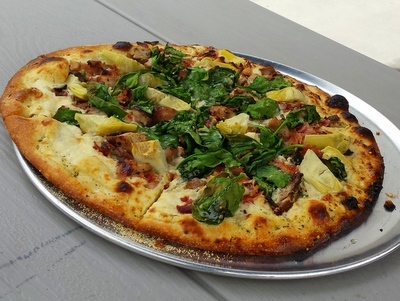 It was a great pizza and the perfect complement to our hard ciders. The Old Mine is high on our list of places to run off to on a Sunny afternoon this summer. 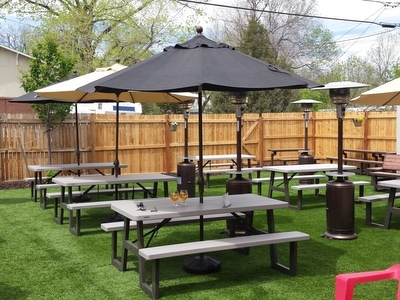 The outdoor patio, great selection of ciders and locally sourced menu reminds me of Central New York in the summer and Lorrell and I definitely need to be on the patio, taking a day off from work in the very near future.